#1 How are you today? Hello everyone! I am new here, I recently ordered my first bespoke suit from a reputable tailor whom charges a lot less than they do on the row but he is said to be excellent. I hesitated between a soft and very nice to touch cloth and something hard wearing which the tailor said would be too heavy and uncomfortable since I get hot very easily. So I did listen to the tailor and chose the soft cloth instead. Now I am worried because someone I know said that softer cloths won't last as long and will get shiny elbows and the like. True or Untrue? I am not rich and I can not afford to replace my suits every year. In my mind the point of bespoke is to get outstanding quality & craftmanship, fit and a garmen which lasts for life if taken care of. Now this is a suit which I will probably be wearing very often as it will be so beautiful, in fact I can not wait until it is finished! Another concern that I had was that the tailor only took about 8 or so measurement. When I asked how many fittings there would be he said none, only when I come to pick it up, then we'd make any necessary alterations and he had never made a mistake before and had a very good eye; this worries me, should there not be at least a fitting? He only seemed to be writing down lots of numbers and drawing a sketch of the suit on his noteblock together with a couple of words. The suit will be fully canvassed. I am just curious as to how he will draw a pattern having only numbers on a piece of paper! Having no fittings would be a concern, also with so few measurements suggests he is cutting from and altering a block pattern, which is not individual to your measurements. If your suit is to be worn on a regular basis and is a soft cloth, it can crumple quite easily and not look very nice. Was this tailor a recommendation, if so have you seen their work on whoever recommended them. Sorry to say, but having no fittings cannot produce a high class garment. There's a lot more here than cloth talk so I hope you don't mind me moving this topic here. I agree that no fittings means it is probably a factory made-to-order type of arrangement with the garment being altered before it was made rather than afterwards, as is usually the case with RTW ie it is not much more than pre-altered RTW. #4 How are you today? No, there seems to be a pattern draft, there are no framed royal warrants on the walls, the shop is in fact the workroom. When I walked in the tailor was working on a suit canvas and I had to wait for him to finish doing something before he could take care of me. The cloth itself is wool but I am not certain about the type, it was one of the more expensive fabrics, it was very soft and pleasant to touch and seemed robust but was still quite thin. As for the suits, I have seen suits made by this tailor worn by a friend, the fit was perfect, the garment was just beautiful, if I didn't know the name of the tailor and had to guess I would have guessed Anderson and Sheppard, it really looked like a suit from the row. All the work is done by hand, or at least I saw them working by hand, as I said the tailor was working on a canvas and he had another tailor working on cuff buttonholes. Very few tailors have Royal Warrants. A&S have at least one fitting. Expensive cloth, then trimmings should also be high quality, yet low suit price! how does he make a living. Any chance of some photo,s when its done? Edited by jukes, 20 December 2010 - 02:02 AM. #6 How are you today? Of Course, I would be glad to post them once the suit is ready! I am curious as to how such a pattern is drawn, from nothing but measurements? Or does the tailor take the shape into account? Or how are things done? Whilst numerous measures are taken the cutter will be observing and taking notes of your posture. He will then draft a pattern to your measurements and posture on either paper or card, bearing in mind that a 3 dimensional human body has to be drawn in 2d on flat paper / card. The pattern will then be placed on the cloth and arranged for minimal wastage of material. Inlays will be allowed beyond the pattern marking in case alterations are required. The cloth is then cut and made up to a first fitting. To take into account a persons abnormalities (which everybody has) and get a well fitted and balanced garment right first time, ie go straight to a finish without fittings is quite frankly impossible, especially if you are a new customer. If you had previously had suits made by the same tailor, your pattern would have been adjusted through the fitting stages and then maybe, if your tailor was comfortable he may go straight to finish. Edited by jukes, 20 December 2010 - 05:02 AM. #8 How are you today? To take into account a persons abnormalities (which everybody has) and get it right first time, ie go straight to a finish without fittings is quite frankly impossible, especially if you are a new customer. If you had previously had suits made by the same tailor, your pattern would have been adjusted through the fitting stages and then maybe, if your tailor was comfortable he may go straight to finish. Perhaps the 'final alterations' are not alterations but really are a fitting. The cost of making a suit that way is not viable, if say the armhole were not in the right position on a coat, it could end up being a remake at their cost, and at the price you say they are charging, would have gone out of business pretty quickly. #10 How are you today? Hmmm, perhaps I missunderstood them? I will ring the tailor and ask. It does seem odd. Clothwise what do you think, is a softer cloth able to last a lifetime or should I have gone with the hard wearing heavy cloth? The problem is that I get hot very very easily even when the temperature is ridiculously low. Edited by How are you today?, 20 December 2010 - 05:31 AM. you will NOT wear a suit a life time! So relax. It all depends on the fitting. #12 How are you today? If this is a good German tailor and you are in the proportions with your figure it is very much possible to get a good suit. So don't worry! You don't need much measures then. If the tailor is accurate there will be no fitting necessary and if he will change it. Soft cloth is nice just take care not to make your suit dirty. A good tailor do't do any drape he just go to a maximum of ease. If you have no money there is always a risk to get a not so good tailor, that is true. But vice versa an expensive tailor must not be good as well. About drape. Some kinds are really nice and others are terrible. There are many kinds of drape. I'm not a fan of drape. The nice ones need to be adjusted in fittings to perfect. Some cutters don't have a good eye and even with fittings they don't do good. 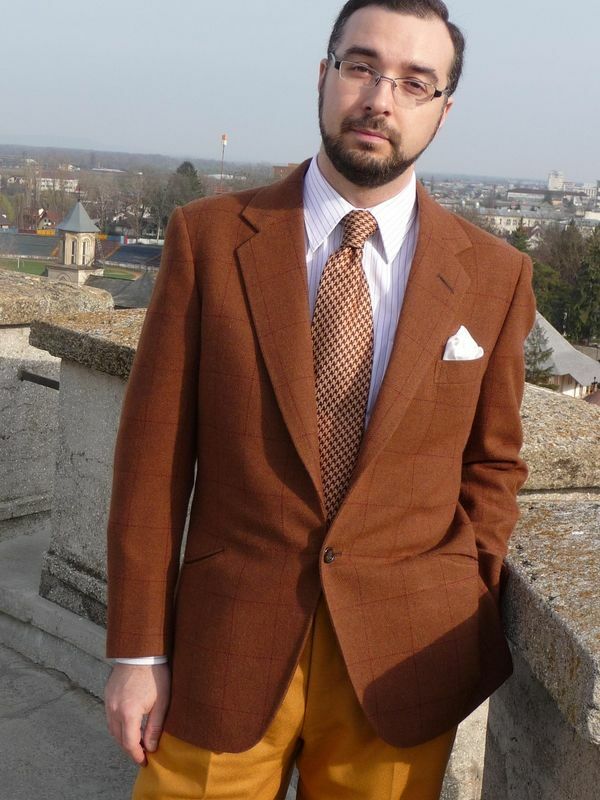 Costi in this thread has a nice drape coat (rusty brown color). I say for a custom/bespoke tailored coat there needs to be at least two fittings with first 3 coats from a tailor. There are exceptions that a few tailors through out history were really good and don't need so many fittings for some customers. A garment can look nice and not really fit. Some are really good at hiding misfits. Some know more about fitting than others. There are all kinds of reasons for all kinds of reasons. Hope your coat comes out the way it should. #16 How are you today? How did he guess that I was German? But yes the suit will be made by an englishman. Not part of this discussion. I walked down Saville Row yesterday, Henry Poole has 2 ball gowns in the window, i wonder if they are branching out into ladies wear. #18 How are you today? Well Henry Poole always was the more 'commercial' tailor on the row with their 'outlets' in china and god knows where.